Good work getting actual numbers mate. What's the blip around 180kmh with the JB+? Sorry Arthur the 9.29 was a 100-200kmh pull not 60-130mph. We tried some pulls in D & E with out any noticeable change in times. Whilst it would seem it's not Jb4 quick it, it is nonetheless still impressive. Ok, its not JB4 quick, that I understand, but is it quicker than the JB+? The JB+ is not slower than bluespark I have jb+ and get quicker quarter mile times with higher trap speeds and faster 100-200kph. People cant say 1 tuning box is faster than the other they all work differently with different cars etc. jb+ for me. Running BS on setting E now. Initially tested on C but after ten miles, cranked it straight up. I ran the JB+ @ about 2 o'clock normally. I tried everything between that and max over the last 25k miles and 3 o'clock (standard) was the worst for gear change smoothness, max gave a lot of low down performance but felt like it was lacking at the top end. The changes weren't bad, by any stretch and easy to live with. Its just that it feels stock with the BS fitted now. Funny that because ive got jb+ and I do quarter mile in 12 seconds @ 117.6 - 119.8mph depending on conditions air temps etc and 100-200kph in 7.9 secs all done on vbox! 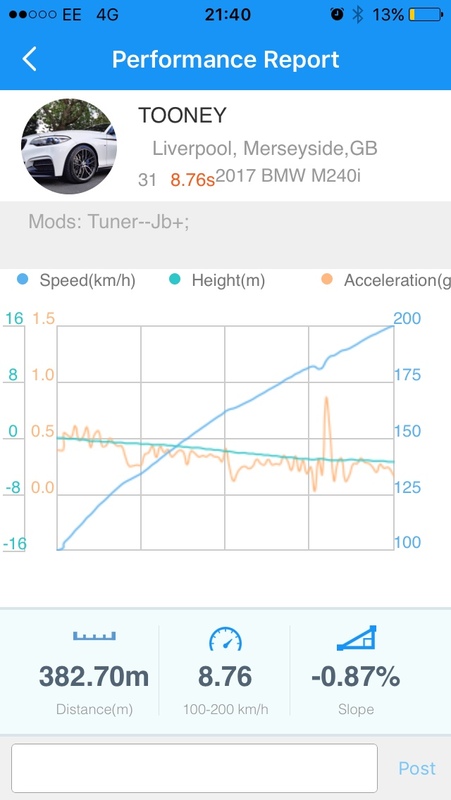 My friend has the bluespark and decat on setting E, he couldn't get better than 12.4 @ 115.6mph quarter mile and 100-200kph in 8.6 secs on my vbox so id say from my experience jb+ has the edge. Im on max setting with jb+ and it pulls unbelievable. Bluespark seem to dyno slightly higher with decat but there deffo not as good on the road. Each to their own. To many differing factors trying to compare two tuning boxes, on two different cars with two different drivers. You're comparing two tuning boxes on two different cars? 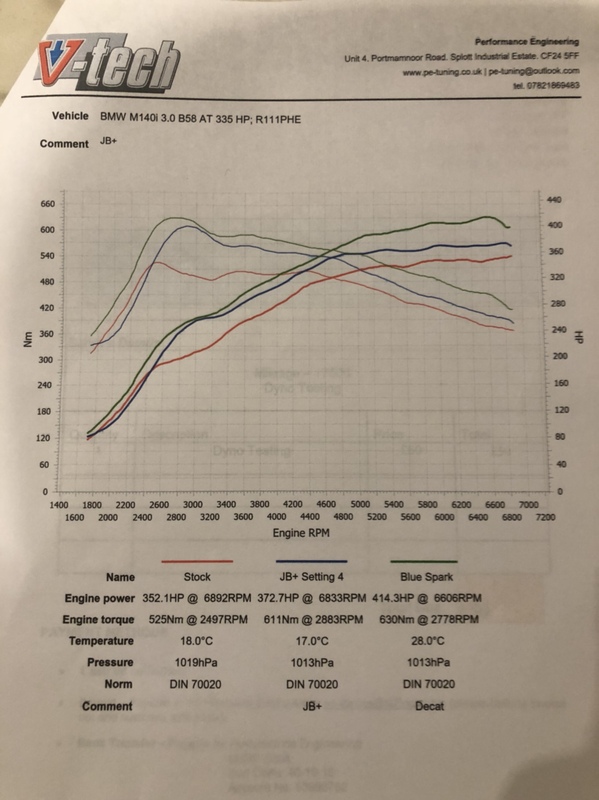 My M140i ran 360hp standard on the Dyno, others 330/340. It's also worth noting that from reading the DME of different cars, it has been noted the B58 standard software has some very different cam timing/ valve lift perameters from the factory that vary from factory software version to factory software version. You're comparing Apples and Cheese I'm afraid, means absolutely nothing. Ol, its not JB4 quick, that I understand, but is it quicker than the JB+? These are my jb+ times with full weight. M140 Shadow edition manual lots of goodies! LMAO well your jb+ must be broke because I’ve got a dyno of bluespark and jb+ back to back and the jb+ did 410bhp and the bluespark did 402bhp. The JB+ Is a weaker more expensive option than the Bluespark. I've been running the bluespark on max setting for nearly a year now and it's faultless. Guy's have dyno'd them with a decat at just shy of 460bhp! JB+ Recently with a decat made 440ish bhp which is still very impressive but the Bluespark is the better choice. Also Ed and the guy's at Bluespark are top notch. The m140 with the jb+ which made 441bhp had a sportscat not a decat, if it had a decat it would have been about the same power as bluespark as the sportscat are still restrictive, if you go on the draggy leaderboard there’s nothing in them in terms of performance. Its awesome to see some independent comparisons on the same dyno with the JB+ and Bluespark. The figures produced here are pretty much bang on with what we would expect from our unit, and they are also using a V-Tech dyno like ours. Proper graph comparisons on the same dyno are far and away better than comparing peak figures from different dynos. Id usually agree with you there, but the numbers on The jb+ There are drastically down on any other jb+ dyno, so not 100% sure on that run, good bs figures though.